At Ryohin Keikaku, our focus is on bringing pleasure to people and beauty to their lives, as well as contributing to society, through the very businesses in which we engage. We constantly think about what we can do to benefit society and the people in Japan and all across the world. What actions should we take to spread our idea of a simple, pleasant life to solve the issues that our society faces? We welcome anyone who is willing to take on this challenge together with us. MUJI products originated in 1980 to create quality products at low prices for Seiyu retail stores (a Japanese supermarket chain) as described by the catchphrase “Lower priced for a reason.” The basis of our product development is to create products that are truly fundamental to day-to-day life without any unnecessary complexity. To achieve this, we take a second look at often neglected materials, streamline the production process, and simplify packaging to create simple, beautiful products that people will cherish for years. We have built on this concept from the beginning, delivering MUJI goods and services designed with both the consumer and the manufacturer in mind to realize our vision of a simple, pleasant life for people around the world. At Ryohin Keikaku, our focus is on bringing pleasure to people and beauty to their lives, as well as contributing to society, through the very businesses in which we engage. MUJI products and services are designed to bring simplicity and beauty into daily life. This has been our way of solving challenges people face across the globe, and society as a whole. For the first time, MUJI stores outside Japan have outnumbered the number of MUJI stores in Japan during the year 2017. However, does opening and operating many stores outside of Japan indicate that we are a global company? We believe that what we actually accomplish at the stores in Japan and all over the world is more essential then the number of stores overseas or how many countries we operate in. Why not take this chance to think about what you can do now and in the future to contribute to society through our businesses? Why are we recruiting talents to Global Headquarters? To recruit talents who can commit to MUJI’s global business in the long-term with a strong sense of ownership. Why are we recruiting Non-Japanese talents to Global Headquarters? To recruit talents, regardless of nationality, with an understanding of Global Headquarters in Japan and potential to lead MUJI’s global business in the future. 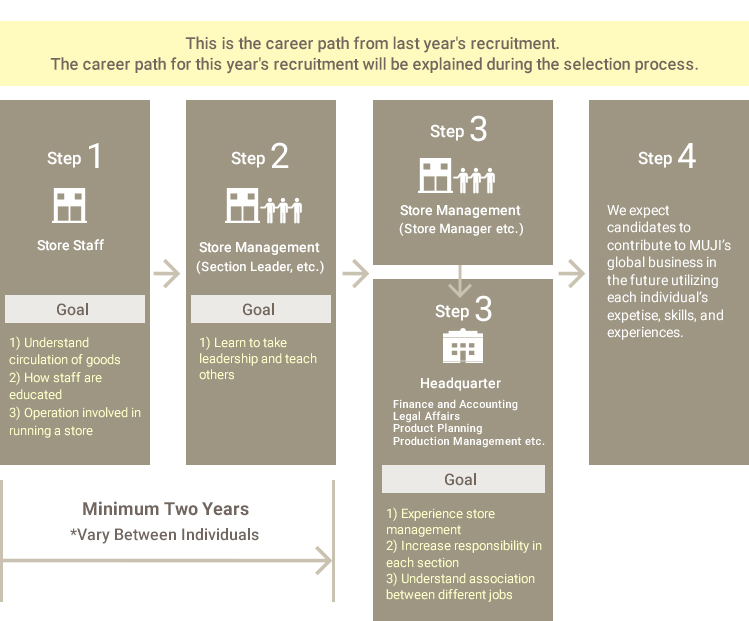 Careers at MUJI begin at the store level. As a management trainee there are various opportunities to experience different business domains, such as store management, product development, global business, etc. to expand and develop your own career. Management trainees are expected to take on challenges at all areas of MUJI’s business. We would like future recruits to take on the role of expanding the MUJI brand to the rest of the world. By developing one’s career as above, candidates will be able to understand the mechanisms between stores and HQ. With that understanding in mind, we expect candidates to contribute to MUJI’s global business. Please refer to the above figure as reference. Depending on the situation the number of years you work at the stores may vary. *Yearly salary could fluctuate depending on the company’s performance and how you are evaluated. You will begin your career at directly managed MUJI stores in or near Tokyo. In the future, there will be opportunities to relocate to MUJI stores across Japan, Global Headquarters in Ikebukuro, Tokyo, or overseas, including countries other than your own. Students who graduate from university/graduate school by August 2019. Applicants will start working in Japan with a working VISA from the beginning of October 2019. Asian Job Express will help candidates apply for a working VISA. Japanese proficiency is neither required nor evaluated during the selection process. However, you will need to be able to communicate in Japanese if you decide to work for MUJI. The company will provide Japanese language training for all recruits to reach at least conversational level Japanese before starting employment from October 2019. Tuition for Japanese language training will be covered by MUJI. 4. First and second face-to-face interview will be held at Singapore, Beijing, Shanghai, and Hong Kong. Web interview sessions will be held for applicants who reside in other areas. Five-day workshop is scheduled in mid-December at Tokyo, Japan. Group work and interviews by HR personnel and board members will be conducted. All travel and accommodation fees will be paid for by the company. We will contact all successful applicants by late-December 2018. Hello, everyone. My name is Chan Tsz Long and I am currently part of MUJI’s recruitment and talent management team. I participated in the AJE program in 2012 and started working for MUJI from October 2013. I started my career at a MUJI store, worked my way up as a store manager, and moved to my current position 2 years ago. One of my current missions is to recruit non-Japanese talent from outside of Japan through the AJE program. Ryohin Keikaku strives to realize our vision of a simple, pleasant life for people around the world through the MUJI brand and other businesses it develops. MUJI aims for people to restrain spontaneous “I must have this” desires that fulfill distinct tastes and embrace a “this is enough” philosophy that looks into the fundamentals of living. The definition of MUJI’s simple, pleasant life is the beauty of simplicity and taking pride in having a modest living. The world currently holds a myriad of environmental and resource depletion issues. Rather than giving priority to monopoly of profits and individual culture values, it is necessary for the future world to value reason that suppresses selfishness by overlooking the world. From a global scale, we want to make life simpler and beautiful through our products and services and ultimately solve societal and global issues. This is why MUJI will continue to propose our vision of a simple, pleasant life. MUJI currently expands its business globally to realize a simple, pleasant life for people all over the world. In 2017 the number of MUJI stores outside of Japan has exceeded the number of MUJI stores inside Japan, representing MUJI’s development to the next stage. We believe that global recruitment is essential for MUJI to continue its progress. Candidates for this program are expected to have a global mindset and lead MUJI’s global expansion in the future. As a global recruit, you will first start your career in Japan and gain a deep understanding of MUJI’s values and how business is done in Japan. This is because the company’s philosophy and business know-how, which is central to MUJI, is found in the stores and headquarters in Japan. Once you learn the fundamentals of MUJI, you will be able to experience various departments in the company where you can utilize your strengths and take part in global business. MUJI is not just a retail company that sells goods. We strive for the realization of a simple, pleasant life that can be seen behind all of our products and services. However, the idea of “simple, pleasant life” and “this is enough” instead of “I want this” cannot be explained only through words. We expect you to understand and spread the idea through your own language to the world. Together, let us build the future of MUJI to realize our vision of a simple, pleasant life. At Idemitsu, we aim to create a society with harmony of the economy and the environment by enhancing our international competitiveness based on our three core businesses: foundation business, resources business, and high-performance materials business. In the foundation business, we will increase international competitiveness through the integration of domestic industrial complexes and advance into overseas growth markets. In the resource business, we will further enhance our resource portfolio by entering the gas business in addition to conventional oil development and coal business.In the high-performance materials business, we are accelerating the development of global products in the lubricating oil, electronic materials and agribio fields and the development of environmentally friendly products. Since its establishment, Idemitsu has been practicing the concept of "respect for human beings" in the conduct of business, and has sought to meet the high expectations of society and to earn its trust. In order to fully demonstrate one's ability in society, a strong sense of responsibility, eagerness for self-development, willingness to study, and a optimistic outlook on things are all important. We respect the values of healthy competition based on trust and consideration toward others. "Intellectual ability" based on critical thinking and "basic academic and professional skills" that are required for business. In the 1980s, we began research and development of organic EL, and in 1997 we succeeded in developing blue light emission organic EL materials with world-class performance. We supply organic electroluminescent materials to a large number of domestic and oversea electronics manufacturers. Our products are implemented in various finished products including car audio and mobile phones. We will continue offering organic EL materials with the world's highest level of performance in response to market needs and offering total solutions including proposals for optimal device configurations based on technologies we have cultivated over many years. In response to the market for organic EL displays such as TVs and smartphones, which will expand in the future, we will be recruiting R&D employees for organic EL materials to respond to customers' needs, such as further higher performance and stable supply of organic EL materials. As China is growing into a worldwide manufacturing and development base of organic EL materials, we believe that Chinese people have great potential for success. In the future we are looking for talent who will lead the business of Idemitsu Kosan as a leader of organic EL industry not only in Japan and China, but across the world. 1) Idemitsu holds the world's cutting-edge technology in the organic EL materials field. 2) R&D will be done in the world's leading technology (i.e., includes R&D not done in China) such as enhancing the performance and stabilizing the supply of organic EL materials. 3) We plan on opening a R&D hub in China. In the future, main work location will be both China and Japan. There is also the possibility to work in other areas depending on the demand of displays. 4) You will begin your career in Japan, but Japanese will not be required during the recruitment process. After you join the company your Japanese language training will be fully covered. 【Note】 Expected yearly salary is calculated with the expectation that one will be promoted to a full-time employee beginning his/her second year. National holidays, yearly anniversary, year-end and new year break, annual paid holidays are provided. Japanese language training will be provided by the company. Interview is scheduled between August to November 2018. Final results will be announced between September to December 2018.